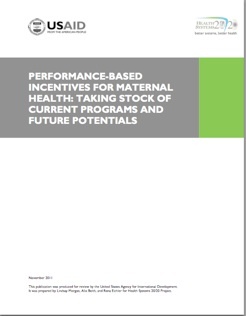 Broad Branch Associates team members contributed to this supplement that considered the evidence on financial incentives for maternal health and future actions. 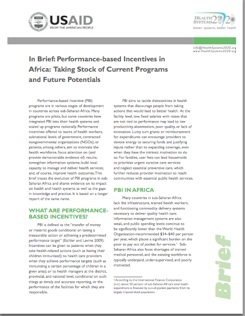 Performance-based incentive (PBI) schemes are gaining traction in developing country health systems. PBI programs are one strategy for increasing the volume, and improving the quality, of health services, and complement investments in inputs. Improving quality of care has been the focus of PBI schemes in high-income countries (HICs), but because many low- and middle-income countries (LMICs) struggle with low utilization of critical services, the primary objective of most PBI schemes in LMICs has been to boost service use. But more programs are focusing their efforts on improving quality of care. This paper provides guidance on developing stronger linkages between quality improvement and PBI in LMICs, by reflecting on current efforts in both HICs and LMICs and focusing mostly on supply-side schemes. Available evidence suggests that programs that address incentives can help to increase the use of essential preventive services, increase the coverage rates of high-impact interventions, and improve quality of care. The first generation of PBI programs focused on the “low-hanging fruit” of child health interventions (in addition to other interventions related to maternal health and infectious disease), namely time-limited actions such as payment for immunizations or for well-baby visits. More can be done to incentivize the pregnancy-delivery-postnatal care-early childhood continuum of care and to improve the quality of services. 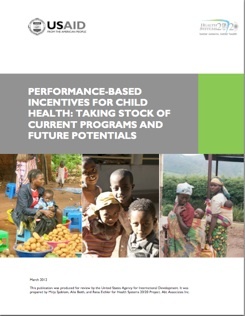 Incentive programs can help to strengthen the focus on the quality of interventions to address newborn health, and to tackle other longer term – and more challenging – childhood concerns, such as nutrition and prevention and appropriate case management of the three main child killers: pneumonia, diarrhea, and malaria. 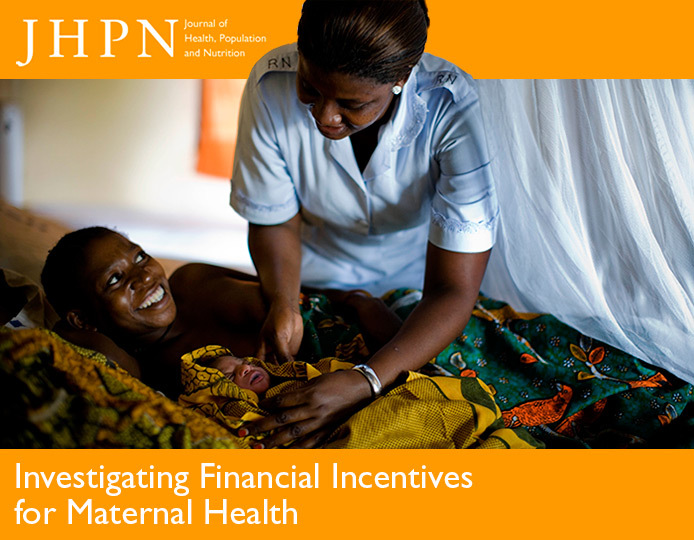 This report is one in a three-part series that explores cross-cutting themes in PBI; other reports examine the experience of PBI for maternal health, and in sub-Saharan Africa. With examples of PBI schemes and ideas for improving PBI approaches, these reports are written for country leaders, donors, and technical assistance providers who are interested in establishing new PBI schemes, or in fine-tuning existing PBI approaches to strengthen their health system and improve health outcomes. 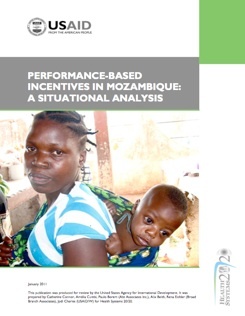 Performance-based incentive (PBI) programs are in various stages of development in countries across sub-Saharan Africa. Many programs are pilots, but some countries have integrated PBI into their health systems and scaled up programs nationally. 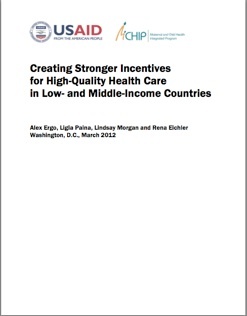 Performance incentives offered to teams of health workers, subnational levels of government, contracted nongovernmental organizations (NGOs), or patients, among others, aim to motivate the health workforce, focus attention on (and provide demonstrable evidence of) results; strengthen information systems; build local capacity to manage and deliver health services; and, of course, improve health outcomes. This paper traces the evolution of PBI programs in sub- Saharan Africa and shares evidence on its impact on health and health systems as well as the gaps in knowledge and practice. It is based on a longer report of the same name. A woman dies from complications in childbirth every minute – about 529,000 women each year, the vast majority of whom live in developing countries. In sub-Saharan Africa, women have a 1 in 16 chance of dying in pregnancy or childbirth, compared to a 1 in 4,000 risk in developing countries – the largest difference between poor and rich countries of any health indicator (UNICEF n.d.). This has spurred momentum around Millennium Development Goal (MDG) 5, which calls on countries to reduce by three-fourths the maternal mortality ratio and achieve universal access to reproductive health services between 1990 and 2015. This Health System 20/20 report is one in a series exploring cross-cutting themes in PBI, including how maternal and child health improvements are incentivized, and the experience of PBI in sub-Saharan Africa. It is intended to help countries and donors engaged in PBI to fine-tune their programs and to help those thinking of adopting such programs as part of their efforts to strengthen their health system and improve health outcomes. After a global snapshot of maternal health, we describe the many types of PBI mechanisms being used to improve maternal health, followed by a look at what we know about their impact. We close with a discussion of some of the gaps and ideas for how these models might be strengthened. Authors Davidson Gwatkin and Alex Ergo warn that universal health coverage is much more difficult to achieve than to advocate. And people who are poor could well gain little until the final stages of the transition from advocacy to achievement, if that coverage were to display a trickle-down pattern of spread marked by increases first in better-off groups and only later in poorer ones. 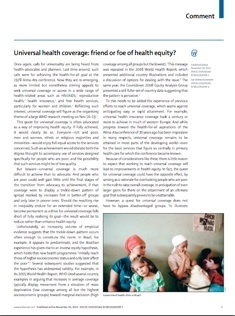 Should the resulting rise in inequality endure for an extended time—or worse, become permanent as a drive for universal coverage falls short of fully realizing its goal—the result would be to reduce rather than enhance health equity. The authors call for an approach called progressive universalism. At its centre lies a determination to ensure that people who are poor gain at least as much as those who are better off at every step of the way toward universal coverage, rather than having to wait and catch up as that goal is eventually approached. 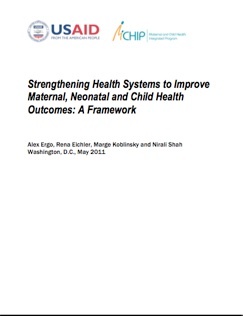 In response to a request by the USAID funded Maternal and Child Health Integrated Program (MCHIP) <http://www.mchip.net/> , and building on existing health systems frameworks, we developed a framework that positions maternal, neonatal and child health (MNCH) interventions within the broader health system. The framework presents a structure to organize information and assess how various health systems strengthening (HSS) initiatives might operate within a health system to cause changes that result in improved MNCH. While progress has been made in reducing child mortality in sub-Saharan Africa, maternal mortality continues to pose a persistent challenge. And to achieve the Millennium Development Goals by 2015, the public health community must continue to focus on ways to reduce these deaths—the vast majority of which are avoidable. 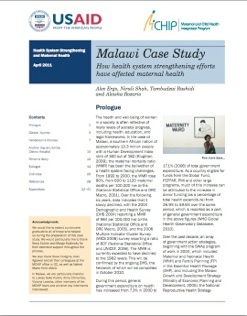 This Malawi Case Study illustrates how health system strengthening efforts have positively affected maternal health interventions and outcomes in the country. Drawing on an extensive review of both published and unpublished literature, data from large household surveys, and information obtained from interviews with key informants, it describes the health systems challenges faced by the Malawian government in the year 2000 and how the system evolved over the subsequent decade. The lessons learned are important to future efforts to improve maternal health in Malawi and throughout sub-Saharan Africa. Development assistance is meant to improve the lives of poor people in developing countries, but the effectiveness of aid in meeting this goal is uncertain. Demonstrating failure –or success– is difficult because traditional donor financing mechanisms track inputs, not results. This is compounded by poor coordination between actors; and a lack of transparency, accountability and country ownership. Development assistance that is ineffective or whose outcome is unknown, wastes resources, erodes the constituency for aid, and most importantly, fails to improve the lives of poor people to the degree that it could. TrAid+ is a new mechanism that aims to address these problems by creating a market for certified development outputs—outputs for which both the delivery and the quality have been verified. By ensuring that these outputs, such as safe deliveries or gas connections, meet certain standards, TrAid+ acts as a third-party stamp of approval that donors, tax payers, recipient country governments, service providers and beneficiaries can trust to know that their aid is being used effectively and is contributing to the development objectives of the recipient country. And TrAid+ makes all information accessible online, making it easier for funders to link with projects that are working and projects that are working to link with anyone interested in purchasing certified development outputs. TrAid+ can be tailored to any sector where outputs can be clearly defined and measured, whether health, education, infrastructure, or agriculture. This paper describes the TrAid+ concept in detail and proposes practical steps to establish the TrAid+ platform. The United States Agency for International Development (USAID), the United States Centers for Disease Control and Prevention (CDC), the World Bank, and other donors are interested in exploring performance-based incentives (PBIs) as a complement to other interventions to improve health outcomes. This report presents the findings of the first visit by USAID’s Health Systems 20/20 Project in October 2010 to assess local interest in and capacity to implement PBIs.